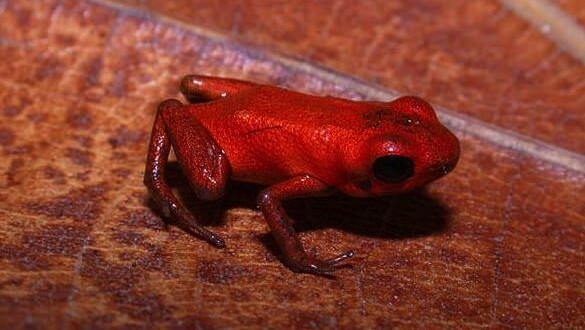 Researchers have discovered a new bright orange dart frog species with a unique call in Donoso, Panama. The new animal is only 12.7 millimetres long. The frog’s smooth skin and its unique call mark it out as different from any of the other frogs in the region, and researchers are unsure how it came to look like it did. Other frog’s poisons have been harnessed by hunters for weapons, but it is unlikely that the new discovery’s poison has ever been used in that way, Andrew Crawford, one of the authors of the study, told National Geographic. The new frog’s poison has yet to be analysed. It has been called andinobates geminisae, and a specimen was first collected in 2011. Scientists have been working since then to understand whether the animal was a new species, and to sequence its DNA. Though researchers have seen the frog before, it was unclear whether it was just another variety of a similar species. Little is known about the species, but it appears to care for its young. Because the animal can only be found in such a small area and so its existence could easily be threatened, scientists have laid out plans for how to protect the frog. That will involve including the frog in a captive breeding programme that helps protect amphibians from diseases and habitat loss.